There was a bit of unwanted excitement last night. At 2:30 AM Nancy woke me. She had a radar contact that was getting closer and was now down to under two miles. The radar trace looked like a rain shower but she was not sure. Through my bleary eyes the contact looked like a rain shower to me too so I opened the hatch and looked outside: no clouds, no moon, and bright stars. So I grabbed the starlight scope and looked in the direction of the contact and saw lights. By now I could see the lights with my naked eye: white lights fore and aft and green. Damn. He was crossing our bow from left to right at high speed. I called Bert from his sleep but he arrived just after the big ship crossed our path about 1/2 mile ahead, making a huge smear across the radar. There was no radio call, no nothing. The big ship simply raced off to the north. None of us are happy. Fortunately no harm was done and I got a very sobering experience. Bert, now wide awake, took the wheel and to my surprise I fell asleep and slept until 7:30. I guess I was tired. I relieved Bert right after I awoke. All is well but I have five targets on the radar to keep an eye on. 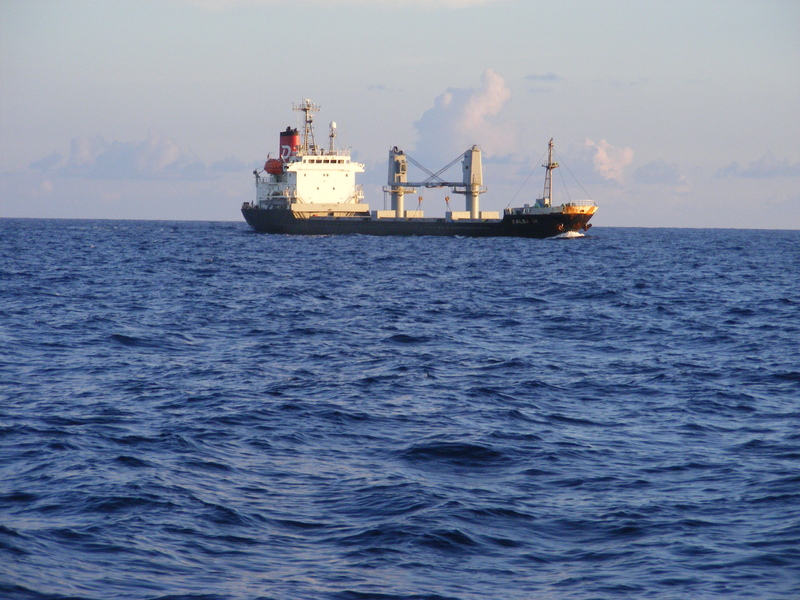 There’s a lot of shipping in the Yucatan Channel. At one point I had a freighter on our starboard quarter making 9 knots on a collision course but before I hailed him he altered course slightly and passed 1/4 mile astern of us. I took photos. The Kodan radar is a terrific tool because it will track multiple targets, show their course and speed, and warn of targets on a collision course. 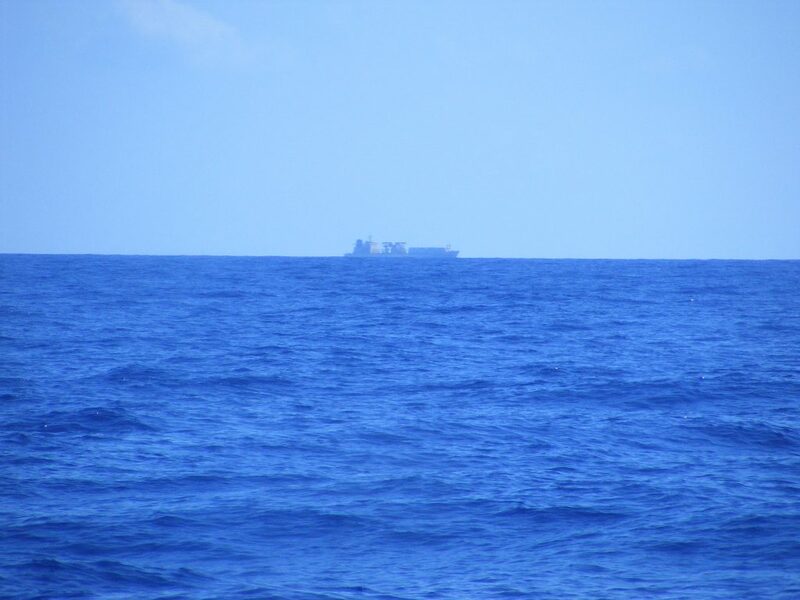 An enormous freighter making 22 knots passed us eight miles off so I got photos of him also. 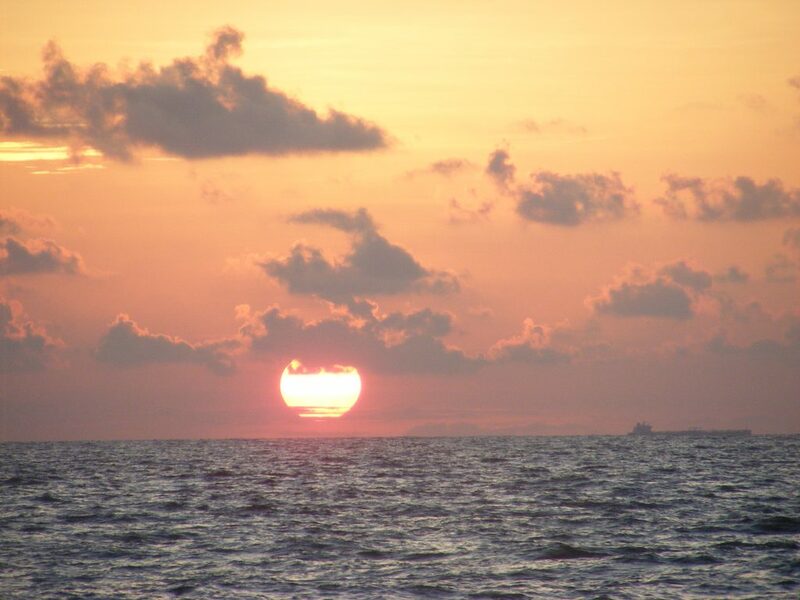 Sunrise in the Gulf of Mexico. Don’t miss the ship in the image. Click to view larger. The seas were getting bumpier so I stowed the second salon chair on top of my belongings and lashed it down. I was tired of it rolling around in the salon and nobody was using it anyway. The sun was hot by 8:30 AM so I turned on the pilothouse A/C. The seas were getting increasingly rolly with sets of swells coming from all directions. I had heard that the Yucatan Channel was kind of wild and it is. Swells and currents are funnelled into the constriction between Cuba and the Yucatan and the ride was no longer the nice flat sea we had before. The northbound current here is very apparent. We are running full speed but only making 3.4 knots over the ground. Early morning in the Gulf of Mexico. Don’t miss the ship at the center. Click to view larger. Bert came back on watch at 9:30 AM to check weather reports and his ham radio skeds so I got busy working on the windshield wipers. They have been broken / inoperable for quite a long time but one can’t complain since they are 36 years old. I tried to save the original mechanisms but there was no way. One was shot completely. Two had been previously repaired or replaced and they were cemented in place with epoxy. Why they were installed that way is a mystery. The nuts and backing nuts work just fine without any glue. I spent pretty much all day working on them and ended up having to destroy them and drill out the thick three-inch long brass bushings with a 5/8-inch drill. The project was made all the more interesting with the boat pitching and rolling in the seas. It’s good exercise. But now there are nice clean holes for new wiper motors assemblies to be installed. 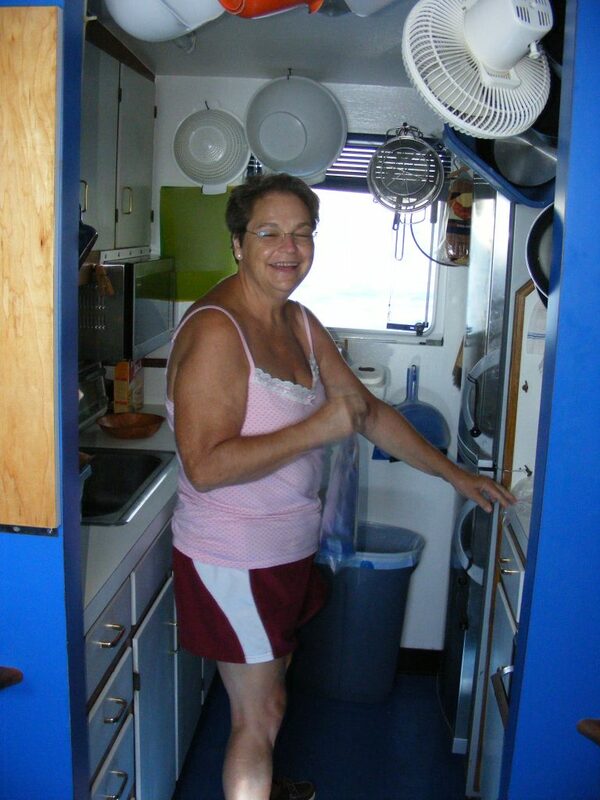 Nancy in the galley of M/V Vagabond. Click to view larger. Another freighter. Click to view larger. 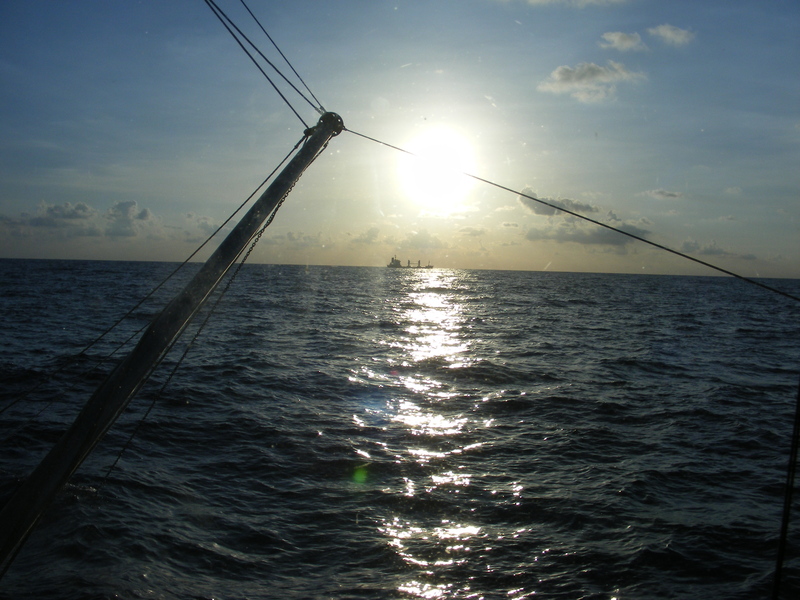 By early afternoon we got into the swifter current in the Yucatan Channel that is the birthplace of the Gulf Stream. At full speed we were making only 2.5 knots over the ground. By late afternoon Bert had had enough and he altered course to the west to get out of the worst of the current, then headed south again towards Isla Mujeres.